Magpie Springs, We have wine, the art and the coffee. We have the wine, the art and the coffee. Half way between Adelaide and Victor Harbor, 5 mins from the historic township of Willunga and 12 mins from McLaren Vale. There are a variety of ways you can enjoy our unique facilities. See an exhibition, sample the wine and try our coffee. Bring a picnic and enjoy the setting in the garden and grounds, try the climbing wall or hold your next function here. One of the first vineyards planted in the Southern Mount Lofty Ranges. We grow all the fruit for our wine which is influenced by the sandy loam, clay and ironstone, the altitude and the cooling afternoon sea breezes. Enjoy a tasting at the Cellar Door or order your wine at our on-line store. The Magpie Springs grounds are a spectacular sight. 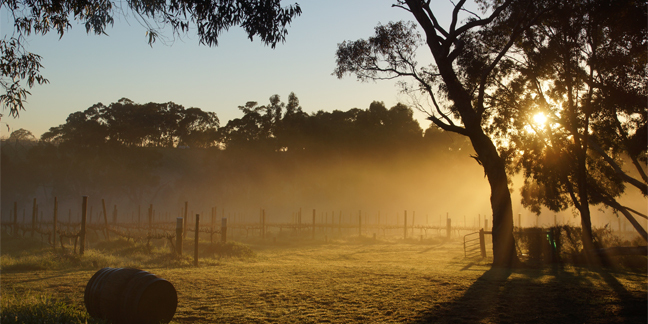 Surrounded by gums, dams and vines alive with beautiful wildlife, all making a visit to Magpie Springs a unique experience. Chardonnay Semillon, Shiraz, Pinot Noir, Riesling, Merlot, Sauvignon Blanc. Some favourites being the Riesling and Botrytis Semillon. An exquisite partnership. A fresh and lively wine can be enjoyed all year round - refreshing. Pairs very well with a wide variety of foods. Light body, tart acidity moderate flavour intensity. Zesty lime/ green apple herbaceous notes. The surprise blend to test the wine aficionado - serve chilled. Elegant, lively crisp and fresh, savoury fizz. Delicate red wine that tastes of red fruits like cherries raspberry ripe tomato, light floral flavors. "The Rowies" creates the opportunity for lovers of wine to become intimately involved with the romance of wine from bud burst to bottling. Have you ever wanted to learn more about wine making and get involved in the process? From start to finish as if you owned the vineyard. "The Rowies" at Magpie Springs brings that opportunity to you. The Gallery is reserved for specific exhibitions by visual artists working in a wide range of media including painting, printmaking, sculpture, textiles, ceramics, and photography. Magpie Springs offers a versatile gallery space for artists to exhibit 2D or 3D works perfect for a solo or small group show in a beautiful setting. Artists please click below to find out how to submit artistic works to Magpie Springs Gallery or download a pdf of the exhibition agreement. Being on the Fleurieu Peninisula Art trail Magpie Springs attracts many visitors interested in viewing and purchasing fine art. Artists who wish to hold pleinair groups/workshops or other artistic endeavours are encouraged. The property is ideal and facilities are available. Contact Magpie Springs to make bookings or discuss exhibiting. See our Facebook page and register for our newsletter to find out more about current exhibiting artists, up and coming shows, photographic competitions, workshops and works on sale. If you’ve visited us before and have a soft spot for a particular piece you left behind, please contact us to purchase online. 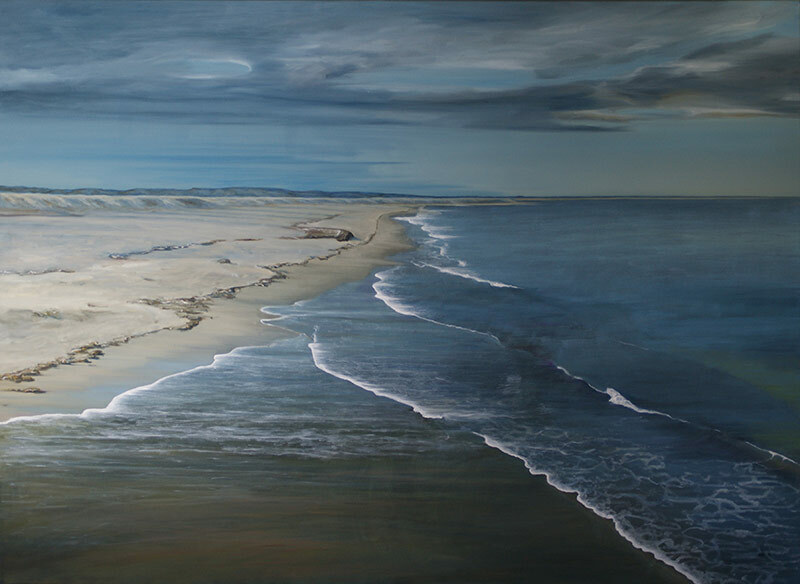 Avril Thomas is a South Australian Artist. 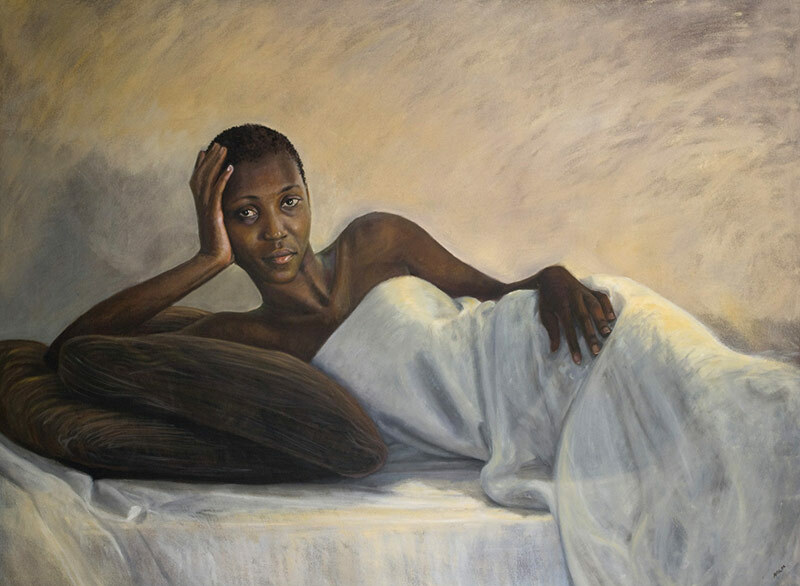 Her works can be found in Hong Kong, the United States and in every state of Australia (except Tasmania) in private and corporate collections and at the National Portrait Gallery, these pieces have all been commissioned. Born in Malaysia in 1956, Avril Thomas has enjoyed a lifetime of drawing. 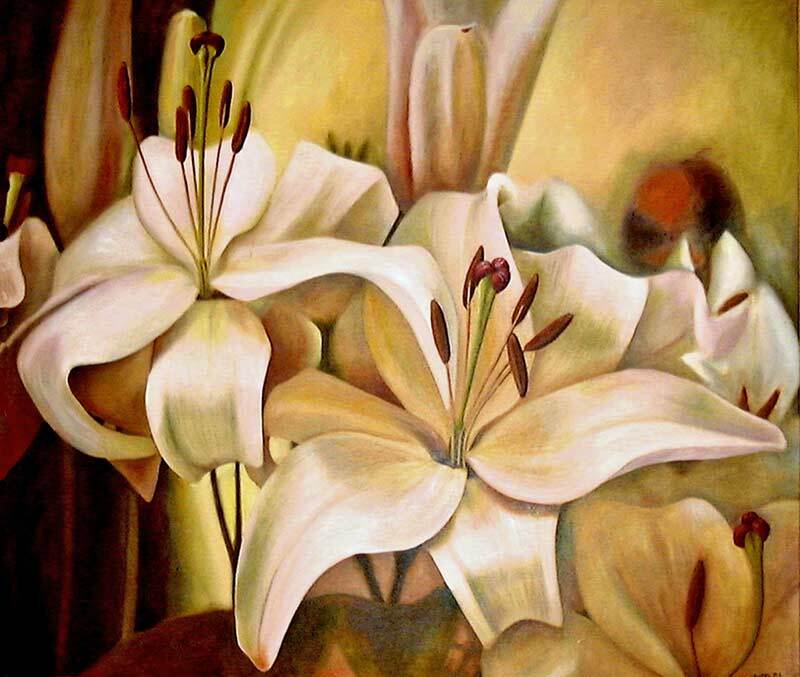 She started her working life as a nurse but through successes with her art work she became a full time practising artist. Portraiture is usually her focus, in charcoal, graphite, pastel and oil, all with a tonal realist style. Her portraits vary in nature from academic portraits, formal pieces and casual to pieces portraying the subjects in their work environment. “When doing a portrait I like to tell a story about the person. A portrait can be about not only their physical being but also about the setting in which they are portrayed. Adding references to things the subject is interested in, or objects which tell something of their story becomes a collaborative process which is extremely rewarding for the subject as well as for me. Whether it be a formal portrait or something more casual, the piece then has an enduring quality which speaks of the person within. A commission by the National Portrait Gallery to paint the then Governor of South Australia, Her Excellency Marjorie Jackson-Nelson AC CVO MBE. Avril Thomas was commissioned to undertake the portrait of the Governor after her portrait of South Australian MP and Minister for Foreign Affairs Alexander Downer was a finalist in the 2005 Archibald Prize. Thomas painted the Governor in a number of sittings at Government House, completing some details from photographs. Included in the portrait are items referring to Jackson-Nelson’s Olympic career, and to her current position. Her kangaroo-skin running spikes lie on the table beside her. On the larger table is a favourite photograph of her grandchildren; two other photographs show the Duke of Edinburgh congratulating her after her Olympic win, and her showing off her medal. The torch is from the 2000 Sydney Olympics, and the figure is a marquette of the bronze, life-sized statue of her in her home town of Lithgow. Two exterior details demonstrate the portraitist’s prerogative of adapting the real to encapsulate a mood or exploit her own skills. The view is of the sweeping drive to the front door of Government House from the west – not the outlook from the room in which the sitter is depicted, but chosen by the artist to emphasise Her Excellency’s role. One major project was a commission by Flinders Medical Centre. 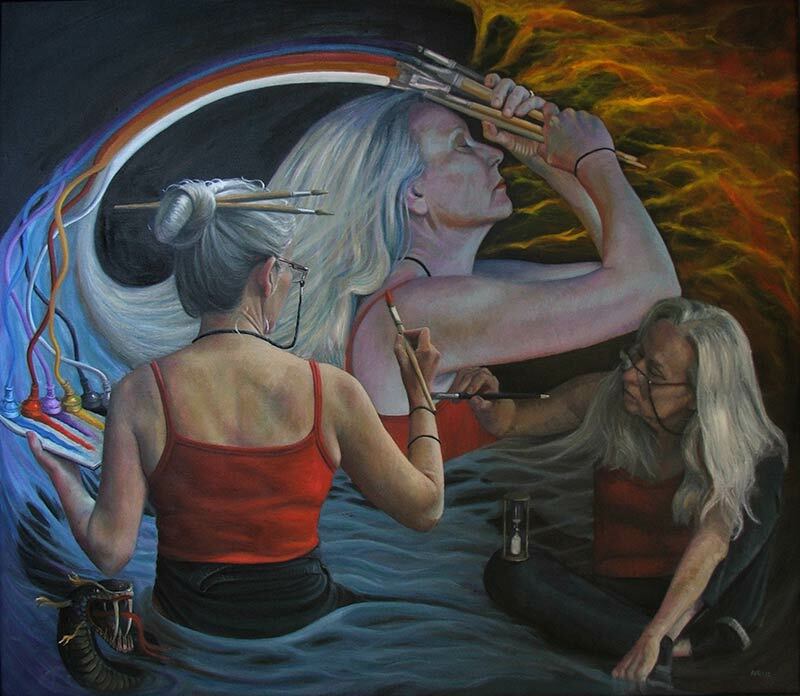 As the artist in residence she produced a suite of paintings and drawings depicting the intensity, compassion and dedication of staff working in the theatres. The exhibition “Theatre Works” was an intensive project with Avril producing 42 paintings and drawings, which captured the ‘choreography’ of surgical procedures in this Art in Health at FMC project. Avril’s experience as a nurse gave her the insight and understanding to undertake this project with sensitivity and confidence. The Theatre Works exhibition was on display as part of the South Australian Living Artists Festival 2009. The response to the pieces was very powerful on so many levels. The reaction from the nursing staff was emotional, they understood what was said visually, "that Yes…. I am part of the team. I am part of this world… and I matter." The patients and visitors alike were fascinated to see what happens behind closed doors and it started many opportunities for conversation about what happens in theatres. Many were amazed at the number of people working in the theatres - a lot more people are involved in a case than just the surgeon and anesthetist. ABC Stateline program featured a segment about the show. There is a rich history artistic theme, with many books written on the subject. Pieces from this show have been used in “the fine art of surgery” by Stephanie Lane and Guy Maddern available on amazon. Theatre Works was followed by another major project as Avril was commissioned by the University of Adelaide, School of Medicine to present their past graduates in an exhibition during their 125th celebrations. These people are at the top of their field in Adelaide and do extraordinary work not only here but nationally and internationally. As Medicine can encompass many disciplines, she traveled from Port Augusta to Noarlunga capturing these extraordinary people in the environment they have trained for and dedicated their lives to. The images ranged not only in the teaching environment at the School but in clinics, pathology labs, theatres and helicopter rescue, as well as in the bush. Due to the limited timeframe and the breadth of the project, she enlisted another artist and they produced a total of 59 artworks, 42 of which were Avril’s. 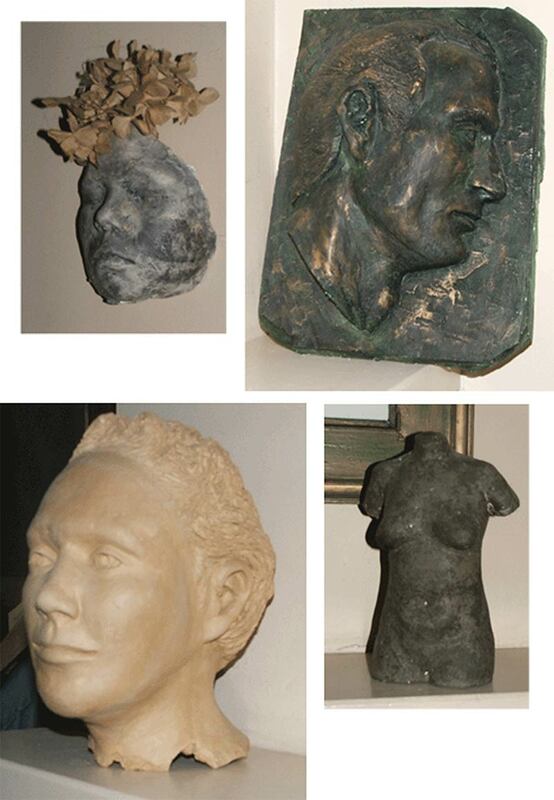 The pieces were exhibited during many of the 125th Celebration functions, as well as at Bonython Hall for the major exhibition “A Day in the Life” of Medicine. Avril has also done a range of academic portraits including for the Flinders University of South Australia's Vice Chancellor Anne Edwards and, in Victoria, for Monash University's Prof. Jock Marshal, Prof. John Swan, Prof. Bill Muntz, Prof. Ian Rae, Prof. James Warren, Prof. Ron Davies, Prof. Ross Norris and Prof. Kevin Westfold. She has also painted Prof. Michael Tyler – world renowned frog expert, The Honorary Dr. Basil Hetzel AC – Emeritus Professor for the Basil Hetzel Institute, Anne Wills – 16 times Logie winner, Cheryl Bart – first mother- daughter team to climb Mount Everest, and Premier of South Australia Mike Rann, amongst many others. You can learn more about Avril Thomas or commission a portrait through her website: www.avrilthomas.net. You can also follow Avril on Facebook. There are a variety of ways you can enjoy our unique facilities. See an exhibition, sample the wine and try our coffee. Bring a picnic and enjoy the setting in the garden and grounds or climbing wall. Book a space for a function – birthday parties, weddings, naming days, corporate gatherings, concerts - design your day to suit. This property has a unique rustic charm nestled amongst rolling hills of the Fleurieu. Weddings, Parties, Functions anything! Whether it is within the Gallery or Cellar Door, outside in the picturesque gardens, under the marquee or among the vines down by the dam, there are memorable photographic locations everywhere. Magpie Springs Vineyard will help create that magic moment. This property has various sites which suit every occasion you wish to think of from ceremonies, weddings, naming days, birthdays to corporate functions…any celebration! 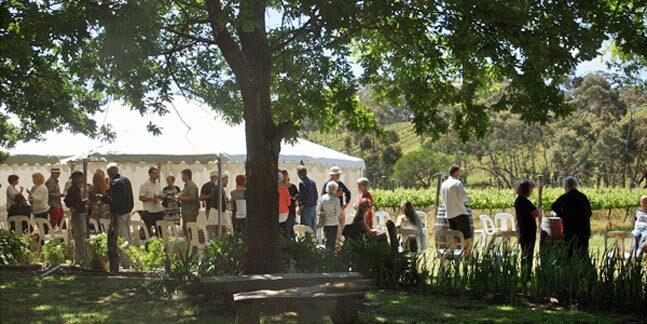 We value our regular customers in the gallery, cellar door and for Southern Boulder - they are important to us. We are open to the public Friday, Saturday, Sunday and public holidays. The price of the venue hire depends on the site required (we suggest you come and see /choose the location) Once you have chosen your site, we know the date, have an idea of the number of guests and whether we need to close the cellar door/gallery for your exclusive private function. Book the space and plan the event to your taste info@magpiesprings.com.au We are not function planners. Once booked we can give you contacts to every function professional you can imagine, so you can tailor the day to your needs. We have a growing list of celebrants, musicians, caterers, hire companies and accommodation all of whom we have either used, or have been highly recommended to us … decide whether to have something simple or the whole extravaganza. You are welcome to come and see the venue. If you need a function planner we can direct you to those as well. We can make suggestions from weddings we have held here already…things that have helped make the day run smoothly….the day is yours to decide. a) If inviting children, for their safety they MUST be supervised at all times. c) The bouldering wall is off limits for people consuming alcohol during a function. Leave it to under 18’s and come back another day. All legal paperwork needs to be signed with a celebrant ONE MONTH before your chosen wedding date. You are very welcome to come and have a look at Magpie Springs. This would be most helpful so we get a clearer picture of your requirements and you get a feel for our unique property. Come see for yourself CHECK FOR AVAILABILITY and Book now for your day. Beans sourced from around the globe, specialising in single origin coffee. Have a cup, mug or buy the beans – can’t get it fresher! A new rock climbing wall set on the beautiful vineyard of Magpie Springs just south of McLaren Vale. If you are in Adelaide, McLaren Vale or anywhere on the Fleurieu Peninsula and looking for things to do, stick your head into the only climbing gym south of Adelaide. Only $10 for as long as you like. Give it a crack at our humble southern crag, jump on the slackline, then grab yourself a coffee or glass of wine. A range of fitness programs and membership options are available.